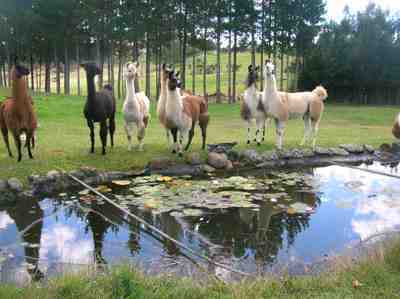 We start our tour of New Zealand llama farms in up north in Kerikeri near the Bay of Islands . 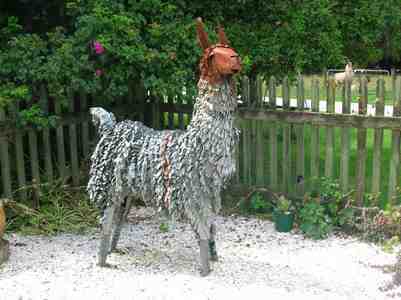 . .
We visited a long-time friend Julie Insley at Rangemore Llama Farm and were greeted by her steely-eyed guard llama. Between Julie’s house and the pastures is a beautiful fish pond. 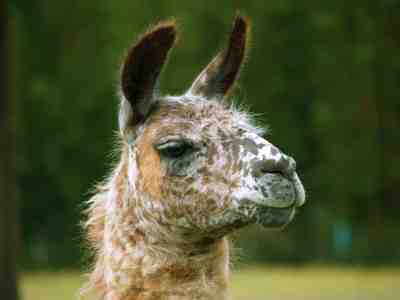 Some of Julie’s llamas . . . This handsome guy is Musicman. 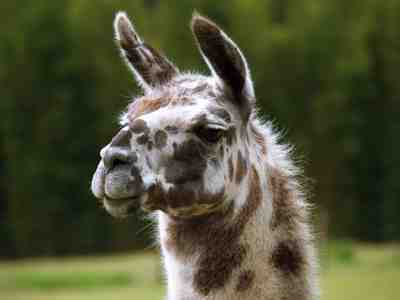 We took a trip with Julie over to the west coast with a couple of her llamas, Jos and Poetry. Jos looks right at home under the fern trees. 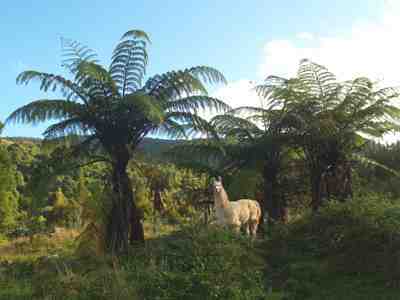 We took a couple of llamas for a hike on an old road through the bush. 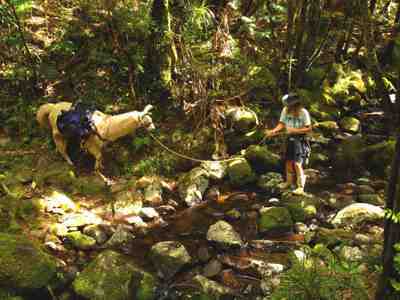 Penny King is negotiating a small creek, full of boulders, with a wary Jos. 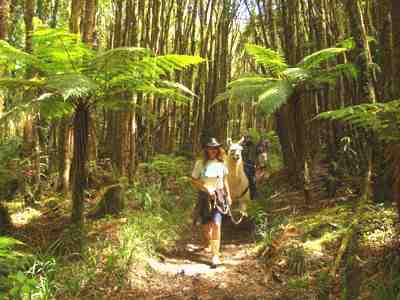 The ferns are huge in this part of the country so it was fascinating hiking along this old trail. 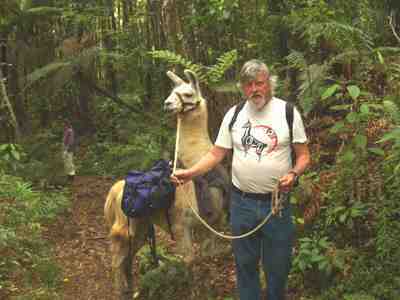 I had to have a photo of myself on the trail to prove that I had been llama hiking in New Zealand. 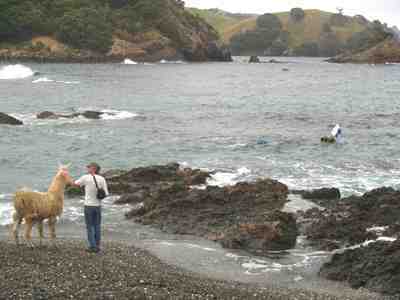 A few days later we visited Matauri Bay on the east coast. 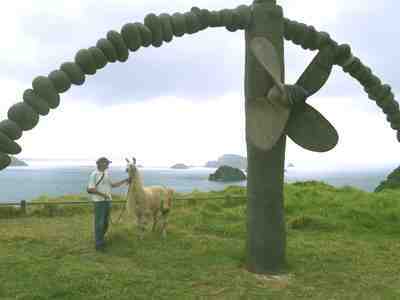 There is a monument to the Rainbow Warrior on the top of the hill. The ship has been sunk out in the bay and can be explored by scuba divers. Julie’s partner, Peter Webster and I hiked up to the monument with Jos. Back down in the bay, Jos was fascinated by some scuba divers who disappeared from his sight.